LA QUINTA, CA – The College on Problems of Drug Dependence (CPDD) Public Policy Forum was held on Wednesday morning, June 13, 2012, and Co-Chaired by Dr. William Dewey from Virginia Commonwealth University (Richmond, VA) and Dr. Martin Iguchi from Georgetown University (Washington, DC). NIH purchasing power, after accounting for inflation, is equivalent to 2002 levels; there has been an effective “undoubling” of the NIH budget. Grant application success rates are down to 18%, and numbers of awards are at 2000 levels. 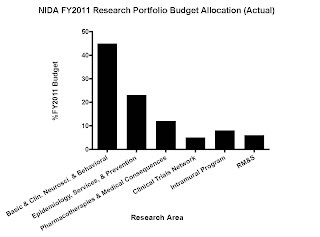 An 8.4% budget cut is possible if Sequestration (cancellation of budgetary resources) occurs and discretionary budget cuts are applied; NIH-wide, this could lower application success rates to below 10% and reduce the numbers of grants funded by 2,300, or close to 25% of all new and competing grant applications. He reported that FASEB commented earlier this year (April 12, 2012) stating that “Sequestration would deal a devastating blow to medical research”. Ed did note that a delay in budget cuts may occur, since the nonpartisan Congressional Budget Office (CBO) has predicted that a recession will occur if the threatened cuts in discretionary programs actually occur, something everyone wants to avoid. Next, Dr. William Dewey reported on Friends of NIDA and commented on the highly distinguished members of the Board of Directors as well as on their efforts to support NIDA. He also mentioned that when CPDD members find themselves in Washington, if they seek to lobby their legislators directly, he can work with Ed Long’s office to arrange appointments with legislative staff members within a day. 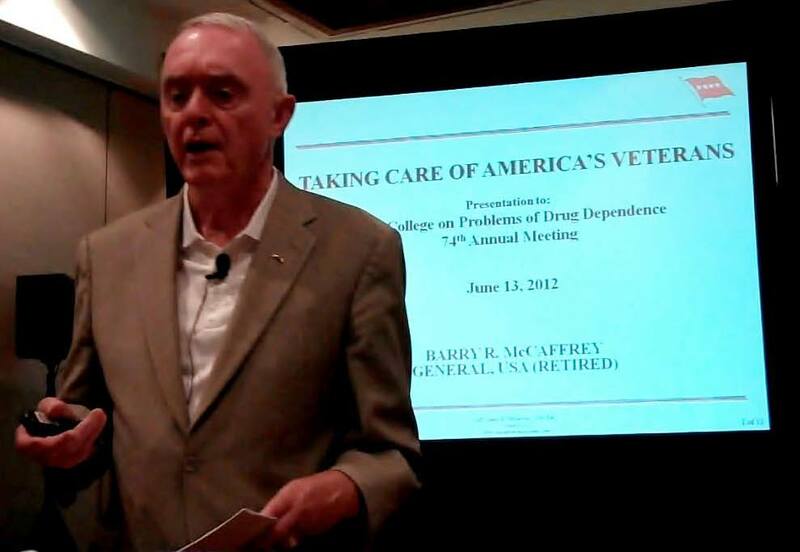 General McCaffrey began by remarking that “Problems of returning veterans are real, significant, and resolvable.” He noted that in the most recent conflicts, the widespread use of improvised explosive devices (IEDs), which can cause unpredictable devastation at any time, promotes prolonged stress, which can exacerbate stress-related disorders including substance abuse. General McCaffrey indicated that while most returning veterans come home unimpaired, that veterans face increased rates of post traumatic stress disorder (PTSD), alcoholism, substance abuse, and suicide. He also noted that underlying mental health issues or addiction disorders present in soldiers before deployment tend to increase the likelihood that problems will be present post-combat. He ended his remarks by commenting that the United States Armed Forces is the most respected institution in American society, with a 79% approval rating, and followed by stating that “We much care for our veterans. They have stepped forward to defend us”. Symposium I at the 2012 College on Problems of Drug Dependence (CPDD) Annual Meeting in La Quinta, CA focused on a very hot topic in the news these days, “Bath Salt” abuse. In the week just prior to the Annual Meeting, the national media reported on a sensational case of human cannibalism thought to be associated with “Bath Salt” abuse. 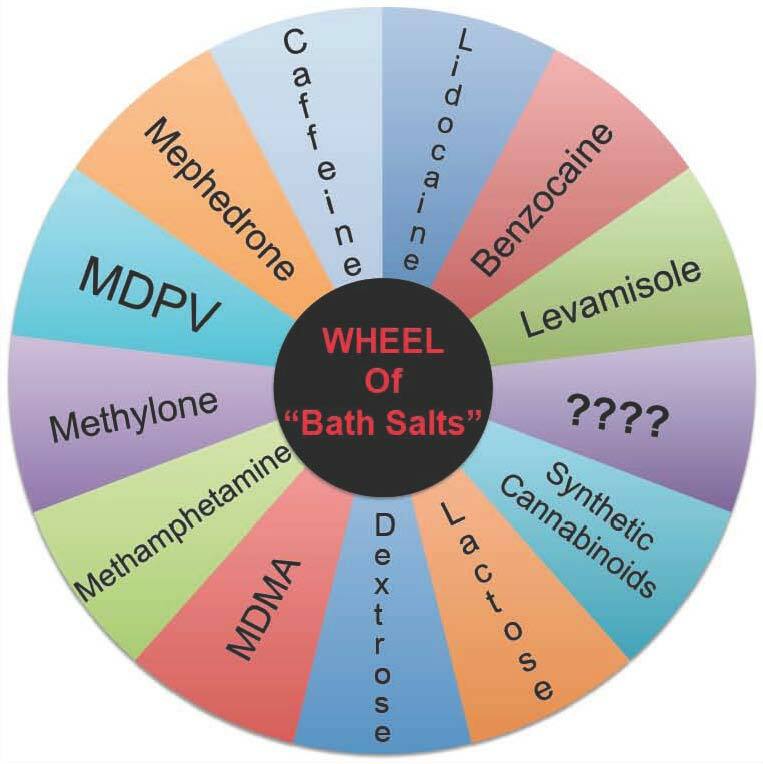 The CPDD Symposium did not discuss that case, but focused on what is known scientifically about the many psychoactive substances found in preparations characterized as “Bath Salts”. Understanding what each of those substances can do physiologically is key to understanding their dangers and to determining how best to treat people who need medical assistance after being exposed to those substances. Symposium presenters included Co-Chairs Michael Taffe from The Scripps Research Institute in La Jolla, CA and Annette Fleckenstein from the University of Utah, in Salt Lake City, UT. Also presenting were Jeffrey H. Moran, from the Arkansas Department of Health, Little Rock, AR, Terry Boos, from the Drug Enforcement Administration (DEA), Springfield, VA, and William Fantegrossi, from the University of Arkansas for Medical Sciences, Little Rock, AR. Dr. Moran began the session by stating that when referring to bath salts, designer drugs, cathinones, K2, spice, etc., it is important to use scientific terms rather than the slang or street terms for these substances, since each preparation has distinct effects. 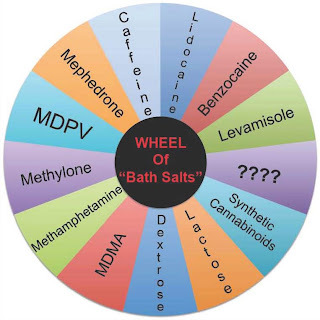 This can be challenging since laboratory analysis of 130 samples seized by the Arkansas Designer Drug Research Consortium documented the presence of 254 distinct chemical entities, in 48 different combinations. Substances included in these preparations were the cathinones methylenedioxypyrovalerone (MDPV), 4-methylmethcathinone (methylone, 4-MMC), 3,4-methylenedioxymethcathinone (mephedrone), as well as caffeine, lidocaine, methamphetamine, levamisole, benzocaine, and synthetic cannabinoids. Thus, the formulation of these designer drug preparations is highly heterogeneous. However, Dr. Moran noted that over 70% of the samples included MDPV. He indicated that the Arkansas Department of Health is working to develop clinical and toxicological testing capabilities to more quickly identify components of these complex preparations. He showed data documenting an explosion in the numbers of emergency room cases associated with abuse of these substances, and indicated that the data on use patterns and chemical compositions are incomplete because they do not account for cases that don’t end up in emergency rooms and hospitals. Terry Boos from the DEA reported that 32 different cathinones have been identified to date in the designer drug market. He noted that cathinone and methcathinone have been Schedule I drugs for awhile and that MDPV, methylone, and mephadrone were placed temporarily on the Schedule I list in October 2011 because they pose an imminent hazard to public safety while having no approved medical or manufacturing purpose. Subsequently, MDPV seizures declined, but new analogs were synthesized and replaced MDPV. He characterized the market for these substances as being “dynamic”, and indicated that sophisticated marketing and sales operations are used to funnel product that to date seems to be almost entirely imported from international sources. He noted that under the analogue provision for Schedule I substances, individuals can be prosecuted for using or possessing substances that are not identical to but are substantially similar (e.g., minor chemical modifications of) to already scheduled substances. Dr. Annette Fleckenstein then reported data from preclinical studies in rats designed to characterize neurochemical mechanisms of mephedrone, methamphetamine, MDMA, and methcathinone. She noted that very subtle structural modifications of these substances can yield profoundly different behavioral, neurochemical, and neurotoxicological effects. For example, methamphetamine and methcathinone induce persistent dopaminergic and serotonergic abnormalities, while MDMA and 4-methylmethcathinone (4-methylation of methcathinone) only induce serotonergic abnormalities. Dr. William Fantegrossi presented data on the thermoregulatory and behaviorally activating effects of MDPV in mice, and showed that it causes hyperthermia at both cool (20C, 68F) and warm (28C, 82F) temperatures. Mice given MDPV at 20C increased their activity independent of the MDPV dose administered. By contrast, at 28C, activity increased at higher MDPV doses, but at the highest MDPV dose tested, activity level dropped and mice exhibited repetitive (stereotypic) movements. Thus, the effects of some of these compounds are dependent upon temperature. Dr. Michael Taffe presented behavioral and physiological data from rats administered several of these compounds and similarly reported differential effects based on chemical structure. He then summarized the Symposium and likened the current epidemic of abuse of these compounds to the designer amphetamine abuse epidemic of the 1980’s, remarking that history seems to be repeating itself. He underscored the point that not all cathinones are the same and each confers a different set of health risks. A newer post describing trends in "Bath Salts" use and its side effects can be found here. LA QUINTA, CA – Dr. Nora Volkow, Director of the National Institute on Drug Abuse (NIDA), presented her annual Report from NIDA yesterday morning at the 2012 CPDD Plenary session. She began by thanking CPDD researchers for their wisdom and efforts to advance substance abuse research. She noted that the work of researchers guides NIDA in its efforts to facilitate the development of addiction science and to create the vision for future addiction science research directions. Dr. Volkow reported that the structural merger process for formulating the new NIH substance use disorders Institute is well underway, and that the timeline now is finite. The draft plan currently is being created and is scheduled for public release in the Fall of this year, at which point, a public comment period will open. In December 2012, the plan and public comments will be presented to NIH Directors, who will configure the final plan that will be submitted to Congress in January or February, 2013. Congress will review the plan and establish its funding allocation in the Spring of 2013, and the new Institute will begin funded operations in FY 2014 (October 2013). Dr. Volkow indicated that NIDA will alert researchers when the public comment period opens in the Fall so they have time to provide feedback. She then acknowledged NIDA staff who she referred to as “silent warriors” and “altruistic” partners in advancing substance abuse research and treatment. She presented a slide showing how the NIDA budget is allocated to substance abuse research areas, and she noted that the NIDA funding allocation for new medication development portfolio has remained stable at about 12% for some time, despite concerns expressed by some researchers that funding in other areas is being sacrificed to support the medication development portfolio. She then turned to the science and highlighted 3 main topics, big dataset science, novel treatment approaches, and HIV research and treatment. Big dataset science typically involves the use of very large data sets acquired by pooling data from many investigators applying similar experimental designs. Accretion of such data substantially increases statistical power, enabling more detailed and complex analyses of complex systems. Dr. Volkow asserted that the field is heading in the direction of supporting more big dataset science initiatives involving genetics, epigenetics, proteomics, brain imaging, clinical data, and systems biology. She also noted that we are not ready yet to take full advantage of big dataset research, and that we are behind other fields including physics, which have developed processes and systems to conduct this type of work. Dr. Volkow indicated that NIH has a data and informatics working group charged to enhance our abilities to work with large databases. She also indicated that NIDA is working on implementing processes to enable large dataset research with brain imaging data. In terms of novel treatments, Dr. Volkow noted that NIDA has been supporting big pharma development of dopamine D3 receptor antagonists to treat stimulant disorders, since it is known both from animal and human studies that D3 receptor densities are elevated in subjects exposed to stimulants. Recently, it was appreciated that the approved anxiolytic drug buspirone, which is a high affinity partial agonist at serotonin 5-HT1A receptors, also has very high affinity for dopamine D3 receptors (it also appears to be a high affinity dopamine D4 receptor antagonist). She showed PET imaging data documenting that buspirone reduces dopamine D3 receptor binding in nonhuman primates, supporting additional study of buspirone as a treatment for substance abuse disorders. The other novel treatment approach Dr. Volkow discussed during her presentation is nicotine and cocaine antibody production. Phase III trials with the nicotine vaccine have achieved only limited success, primarily because only 30% of those immunized sustain adequate antibody levels. Those individuals do reduce nicotine intake, indicating that the mechanism does work. Thus, researchers are working on ways to increase efficiency of antibody production, and also are working on ways to identify individuals who upon immunization are likely to produce high antibody levels. New research using adenovirus vectors, which are extremely efficient at producing high antibody levels that are sustained for long periods, suggests that the adenovirus approach may work well: PET imaging results document that adenovirus anti-cocaine immunized monkeys do not sustain significant brain cocaine levels after cocaine administration, suggesting that this approach may be effective in humans. The last scientific topic covered in the presentation was the breakthrough finding that antiretroviral treatment (ART) for HIV infection not only slows HIV progression, but also prevents new infections in partners of HIV-infected subjects. The work that led to this discovery was funded by a NIDA Avant-Garde program grant to Julio Montaner in 2008, which itself led to a Canadian government grant to focusing on substance abusing populations and aggressively seek, test, and treat subjects to reduce transmission. Dr. Volkow lamented that despite this research, daily injection drug abusers still are less likely than other HIV positive individuals to receive ART until later in the disease process, meaning that its more likely they can infect others. She noted that this gap in application of evidence-based science supporting early ART must be overcome by instituting a cultural change among treating physicians. Dr. Volkow ended her presentation by once again highlighting the power and value of big dataset science, citing the recent brain imaging and genetics study of over 400 twin pairs that elucidated the influence of genes on human brain structure. Have you ever been contacted by the media to speak about a current event or your or someone else’s research? If so, did you know what to do? If not, are you ready when a reporter comes calling? Can you talk about your research in a clear and concise manner understandable to the general public? 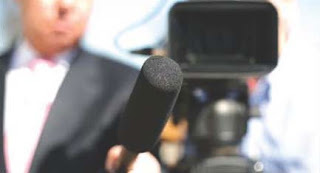 Do you know why its important to accept media interview opportunities? The Media Training Forum scheduled for Tuesday morning at the CPDD Annual Meeting will answer some of these questions and offer tips on media interactions, interviewing, and scientific communications. Panelists include Bertha Madras, who as Deputy Director for Demand Reduction at the White House Office of National Drug Control Policy (ONDCP) served as a very high profile scientist, and Shari Roan, science reporter and frequent contributor to the Los Angeles Times. Bertha will talk about some of her memorable media experiences while at ONDCP and Shari will offer a reporter’s perspective on what its like to interview scientists. There will be an opportunity to practice and be coached on your interviewing skills via brief mock interviews that will be videorecorded and played back. During playback, Bertha will coach volunteer participants and the audience. Co-Chairs Marc Kaufman and Kathleen Brady will introduce the session and serve as Discussant, respectively. We hope to see you in Flores 5 on Tuesday morning from 10-noon. If you can’t make the session but are interested in learning more, you can find a great media training guide online targeted to addiction researchers right here. 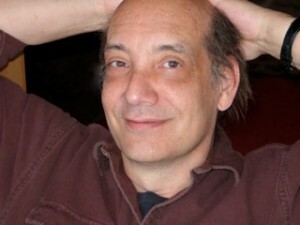 Mr. Dirk Hanson is an author, free-lance writer, blogger, and winner of the 2012 CPDD/NIDA Media Award. He is receiving this award for his contributions that enhance the public understanding of scientific issues concerning drug use disorders, including his book entitled "The Chemical Carousel" and his blog "Addiction Inbox". CPDDBLOG interviewed Mr. Hanson to find out more about his background and his work. CPDDBLOG: Tell us a little about your background before you wrote your book on substance abuse, “The Chemical Carousel”. Dirk Hanson: I came out of a liberal arts educational background. As a journalist, I started working as a business reporter for the Des Moines Register, and after moving to California, I was hired by a trade newspaper in the late 70s to cover a place south of San Francisco known as Silicon Valley. I was one of the first journalists to cover Silicon Valley microchip companies as a full-time beat, and it was all based on solid-state physics, about which I knew nothing at the time. However, I interviewed people like Ted Hoff, inventor of the microprocessor, and Robert Noyce, president of Intel and co-inventor of the integrated circuit. Eventually I took the time to write a book about the emergence of Silicon Valley. That was my introduction to science writing. It was a great training ground. My early interest in computers and artificial intelligence—along with some drug and alcohol misadventures of my own—led me to an interest in neuroscience, drugs of abuse, and addiction. CPDDBLOG: After authoring 3 books, what led you to concentrate on using blogs as your primary medium and focus your blogging on addiction science? Dirk Hanson: When I went out to sell my addiction book in 2008, the world of book publishing had changed, to put it mildly. Authors were expected to do most of their own promotion, so as a companion project, I started a blog, Addiction Inbox, for short news on addiction topics, and as an online presence for the book. But the blogging quickly took on a life of its own. I found that it was an ideal platform for me as a writer. And, after the blog gained some attention, it opened up online freelance opportunities for additional articles about drugs and addiction. There is a genuine appetite on the web for straight talk about the neuroscience of dependence, craving, and reward, and for basic information about the biochemistry of addictive substances. CPDDBLOG: An independent review of your book The Chemical Carousel concluded that it “…is a book for the rest of us: friends and families of addicts, support groups, and healthcare professionals alike”. Since many scientists find it challenging to effectively communicate their message to the general public, do you have any tips on how best to present science to the public? Dirk Hanson: In both my book and my blog posts, I try to treat my readers as intelligent lay people with an interest in science. I come at it from the perspective of a beat reporter. I’ve interviewed dozens of key researchers in neuroscience, pharmacology, and psychology. I concentrate on explaining brain function, and particularly the function of reward systems. But I’m not an M.D. or a research biochemist or a psychology professor, so my perspective is naturally different from theirs. I don’t think you have to “dumb it down,” but in science writing, you do have to take great precautions to insure accuracy and clarity. And you have to find a tone that is conversational but not condescending or overly technical. Frequently, readers tell me that they like being challenged; they like it when I don’t assume they’re idiots. And because of my own background in the Humanities, I also like to do “softer” pieces, such as book reviews, essays on public health policy, or articles on general science issues like fMRI scans. My specific area of focus is on pharmacological approaches to treatment—fighting fire with fire. CPDDBLOG: What are your future plans for writing and blogging? Dirk Hanson: I’d like to explore the possibility of doing shorter e-books on selected drug and addiction topics, for one thing. And I plan to continue freelancing on addiction, pharmacology, and the brain. My most recent freelance piece was an article on schizophrenia and cigarette smoking for The Dana Foundation. In addition, writing a blog turns you into a columnist of sorts, providing fresh material on a regular basis. It takes time and research to keep it active and engaging for readers. But the rewards are there. For example, one of the blog’s discussion threads, on the topic of marijuana withdrawal, has garnered more than a thousand comments since I first posted on the subject. The online audience pretty directly engages with you and your work sometimes. CPDDBLOG: What does winning the CPDD/NIDA Media Award mean to you? Dirk Hanson: This award is a wonderful validation from the very people whose work I try to interpret for others. I understand that a journalist is not always a scientist’s best friend, so I deeply appreciate the vote of confidence. Also, I think it helps bring attention to online means of presenting reliable information on addiction to a general readership, and hopefully, advancing the public’s understanding of contemporary addiction research. The online world of science communication is here to stay, and that can only be a good thing in the long run. CPDDBLOG: Thanks for taking the time to answer these questions, and congratulations on winning our Award. More than 1100 scientists will be participating in the 74th Annual Meeting of the College on Problems of Drug Dependence (CPDD) to discuss their latest findings on drug abuse and dependence. CPDD is the largest and oldest organization supporting research on the scientific explanation of drug use and dependence. A broad range of research will be presented addressing mechanisms for development of drug dependence, its prevention, and its treatment, at the La Quinta Resort & Club, Palm Springs, CA. Among the many research topic presentations are symposia and workshops on the rapidly emerging drug problem, Bath-Salt abuse (Sunday PM, Flores 4), on mobile treatment interventions for substance abuse (Tuesday PM, Flores 6-8), and on drug effects in the developing brain (Wednesday PM, Flores 4). On Sunday morning at the Plenary Session (Flores 4/5), achievement awards will be presented to outstanding individuals for their contributions to the field of addiction science. Those honored include Dr. Edward Sellers, who will receive the Nathan B. Eddy Award for lifetime contributions to the field, Dr. Joshua Lile, who will be presented with the Joseph Cochin Young Investigator Award, Dr. Kathryn Cunningham, who will be recognized for her efforts in mentoring junior drug abuse researchers, and Mr. Dirk Hanson, who will receive the CPDD/NIDA Media Award for outstanding contributions to the public understanding of scientific issues concerning drug use disorders. In addition, Dr. Nora Volkow, Director of the National Institute on Drug Abuse (NIDA), will present a Report From NIDA, and R. Gil Kerlikowske, Director of the White House Office of National Drug Control Policy (ONDCP), will address the Plenary Session with a presentation entitled “National Drug Control Policy: Emerging Opportunities for Policy and Biomedical Research”. CPDD will hold its President’s Symposium entitled “Addressing the Challenges of Tobacco and Alcohol Use” (Sunday PM, Flores 4/5). Sunday through Thursday afternoon, CPDD members will present new and exciting research findings in poster and oral presentations. Highlighted presentations include reports on prescription opioid diversion patterns (Cottler et al., Sunday PM, Flores 6-8), on unmet substance abuse treatment needs among veterans (Golub et al., Monday PM, Flores 6-8), on excess hospital utilization by illicit drug users (Kertesz et al., Tuesday PM, Fiesta), on the reduction in oxycontin exposures since its reformulation to deter misuse (Coplan et al., Wednesday PM, Fiesta), and on how restrictive state laws on graduated driver licensing reduce teen drinking and driving (Cavazos-Rehg et al., Thursday AM, Fiesta). This is only a small sampling of the hundreds of reports and information sessions that will be presented. To learn more about these events and to find topics of interest, search the freely downloadable meeting program and abstract listings by clicking the “2012 Program Book (pdf)” and “2012 Abstract Book (pdf)” links. Media personnel are invited to attend Plenary and Scientific sessions.